They came, in colonies settled around Jamestown, with the pilgrims at Plymouth Rock in the Massachusetts Bay, and they began what we would term the America of today. 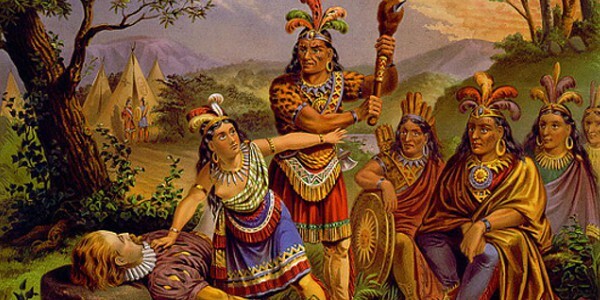 There would be treaties with the Indian nations and battles amongst warring tribes. There would be contests of wills between colonies funded and founded by British, Spanish, and French concerns. But this would be the century that began true settlement, for all its wonder and hardship and harbinger of a nation that would come. You can visit much of the Pre-Revolution history of the United States throughout the many trails and historic sites of the nation. And don't miss out on the Native American history throughout Florida or other regions. 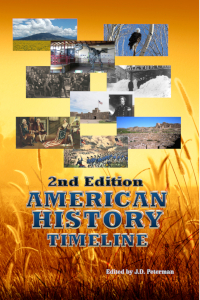 The history of the nation and North America comes from the culture of the many tribes that made up the mosaic of human culture in each state. They were here before the majority of us, after all, and their history is an amazing collection of wonder, beauty, and dedication to the land that sits beneath us. Picture above: Pocahontas, Source: World Noted Women, D. Appleton and Company, 1883, Wikipedia Commons. Right: Pocahontas Saving the Life of Captain John Smith, New England Chromo. Lithograph Company, 1870. Courtesy Library of Congress. December 11, 1695 - Colonial Governor of New York, Richard Coote, and British King William III send Captain William Kidd on a mission to combat piracy, but by the end of his journey, Kidd becomes a pirate of the high seas. He would be hanged in 1701. Some say it unfair to label Captain William Kidd a pirate. His mission, began by the 1st Earl of Bollomont, Richard Coote, on his way to elevation as the 12th Colonial Governor of New York, and King William III, was to control the acts of piracy on the seas which was plaguing commerce between the New World and the mother country, as well as to its other possessions around the earth. Kidd could not turn this kind of request down. The most wealthy lords of England would back the journey, including Coote, and perhaps, even the King. He had his orders to attack and commondeer the loot of pirates such as Thomas Tew and Thomas Wakes in a Letter of Marque, and the ships of their enemy, those darn French, in a Letter of Reprisal against French merchant ships from the King. The British Crown would retain ten percent of the captured treasure for themselves; Kidd would assumedly get the rest. A new ship was constructed, the Adventure Galley. It would be equipped with thirty-four cannon and hold eighty crewmen. Some reports state one hundred and fifty while his letter of Marque from the King stated eighty. When the British Navy took some of his crew into naval service, Kidd sailed from Plymouth,, England to New York City, captured a French ship en route, then hired other crew, some of which had piratical pasts themselves. With new crew intact, Kidd sailed the Atlantic, then Indian Ocean looking for pirates, but had little luck. The enterprise was failing, his ship sprung leaks, and members of his crew succumbed to an outbreak of cholera (nearly one third) and others left when reaching port. Captain Kidd was struggling to cover his costs. Finally, on January 30, 1698, over one year after the beginning of his venture, an Indian ship, the Quedagh Merchant, under contract to American merchants, but with papers from the French East Indian Company, yet captained by an Englishman, was hailed and captured. 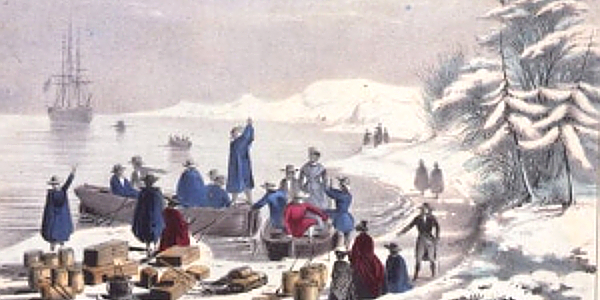 Kidd thought with an English captain that the ship should be set free, but with the urging of his crew due to the value of its cargo, estimated at seventy thousand British pounds, and French connections allowed in his commission within the Letter of Reprisal, Kidd kept the prize. When the news reached England, his reputation as a pirate rose and the English Navy now favored pursuit of Kidd and his capture. Kidd eventually made his way back to New York City with knowledge that he was now considered a pirate; Governor Bellomont, in Boston, offered clemency, which Kidd decided his best course of action. However, the Governor, aware that his association with Kidd could bring claims of himself being a pirate, renegged on his clemency pledge. He imprisoned Kidd on July 9, 1699 in Boston's Stone Prison. Over the next year, Kidd was sent back to England to confront the High Court of Admiralty. The charges had been raised from piracy to piracy and murder for his previous harsh treatment of his crew. Kidd was found guilty and hanged in 1701. At odds today with his trial is the rationale for his guilty plea. The documents, including the below, could not be found, that might have given Kidd the rights to take the Quedagh Merchant. Those documents had been lost and would not be recovered for two hundred years. That, however, would only address the piracy charges. And why didn't the King of England, William III, stand up for Kidd, at least against the piracy claims when he had been party to the Marque and Letter of Reprisal against the French. Well, William III was enbroiled in his own troubles at the time, waging a battle about who would become his successor. But what about Kidd's treasure? In 2000, the shipwreck of the Adventure Galley, which Kidd had scuttled before heading back to New York City, was found in water off the coast of Madagascar, along with bottles of rum and pottery. By 2015, a bar of silver, one hundred and twenty-one pounds, was found. William the Third, by the grace of God, King of England, Scotland, France and Ireland, defender of the faith, &c. To our trusty and well beloved (1. Privateer captain's name) Capt. Robert Kidd, commander of the (2. Vessel's name) Adventure Galley with a crue of 80 men and mounting 30 carriage guns. Greeting: whereas we are informed, that (3. First pirate captain's name) Capt. Thomas Too, (4. Second pirate captain's name) John Ireland, (5. Third pirate captain's name) Capt. Thomas Wake, and (6. Fourth pirate captain's name) Capt. William Maze or (7. Fourth pirate captain's alias name) Mace, and other subjects, natives or inhabitants of New-York, and elsewhere, in our plantations in America, have associated themselves with diverse others, wicked and ill-disposed persons, and do, against the law of nations, commit many and great piracies, robberies and depredations on the seas upon the parts of America, and in other parts, to the great hindrance and discouragement of trade and navigation, and to the great danger and hurt of our loving subjects, our allies, and all others, navigating the seas upon their lawful occasions. Now know ye, that we being desirous to prevent the aforesaid mischiefs, and as much as in us lies, to bring the said pirates, freebooters and sea-rovers to justice, have thought fit, and do hereby give and grant to the said Robert Kidd, to whom our commissioners for exercising the office of Lord High Admiral of England, have granted a commission as a private man-of-war, bearing date the 11th day of December, 1695,) and unto the commander of the said ship for the time being, and unto the officers, mariners, and others which shall be under your command, full power and authority to apprehend, seize, and take into your custody as well the said (3. First pirate captain's name) Capt. Thomas Too, (4. Second pirate captain's name) John Ireland, (5. Third pirate captain's name) Capt. Thomas Wake and (6. Fourth pirate captain's name) Capt. Win. Maze or (7. Fourth pirate captain's alias name) Mace, as all such pirates, free-booters, and searovers, being either our subjects, or of other nations associated with them, which you shall meet with upon the seas or coasts, with all their ships and vessels, and all such merchandizes, money, goods, and wares as shall be found on board, or with them, in case they shall willingly yield themselves; but if they will not yield without fighting, then you are by force to compel them to yield. And we also require you to bring, or cause to be brought, such pirates, freebooters, or sea-rovers, as you shall seize, to a legal trial, to the end they may be proceeded against according to the law in such cases. And we do hereby command all our officers, ministers, and other of our loving subjects whatsoever, to be aiding and assisting to you in the premises. And we do hereby enjoin you to keep an exact journal of your proceedings in execution of the premises, and set down the names of such pirates, and of their officers and company, and the names of such ships and vessels as you shall by virtue of these presents take and seize, and the quantities of arms, ammunition, provision, and lading of such ships, and the true value of the same, as near as you can judge. In witness whereof, we have caused our great seal of England to be affixed to these presents. Given at our court in Kensington, the 26th day of January, 1695, in the 7th year of our reign. Source: Image above: William Kidd in New York Harbor, 1932, Jean Leone Gerome Ferris. Courtesy Library of Congress. 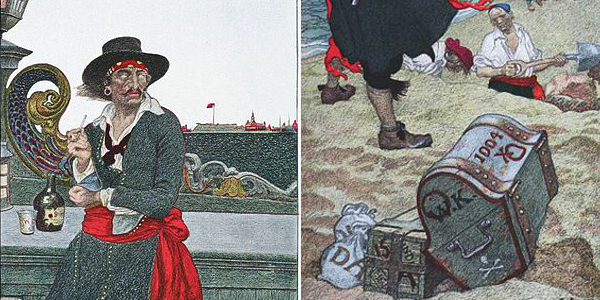 Image below: Montage of two paintings of William Kidd and his buried treasure, prior to 1911, Howard Pile. Courtesy Wikipedia Commons. 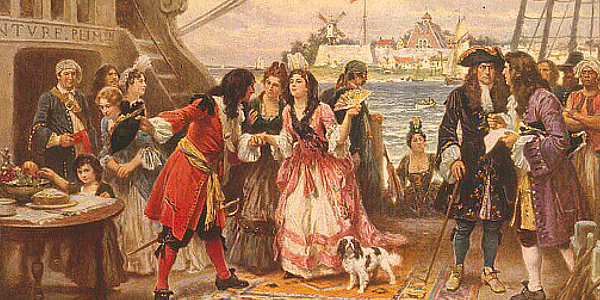 Info source: Piratedocuments.com; "Captain Kidd's Treasure Has Finally Been Discovered," Smithsonian Magazine; "Captain Kidd, the Unluckiest Pirate in History," 2016, Tijana Radeska, thevintagenews.com; Wikipedia. 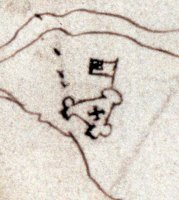 John Smith's drawing of the Jamestown settlement. Courtesy Wikipedia Commons. Landing at Plymouth Rock. Courtesy Wikipedia Commons. 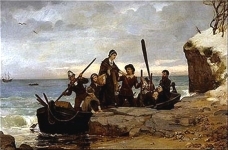 The pilgrims on shore at Plymouth Rock with the Mayflower in the background. Courtesy Library of Congress.